I have a Calla Lily that is probably around 6/7 years old grown in a pot, as the Falklands winter is too cold to have it outside. Although I have potted it, it is in too big a pot for the sitting room now. Is it possible to divide it by cutting through? 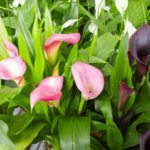 Yes, dividing calla lilies is quite simple. Simply divide the rhizomes in the spring and replant/repot.